Blackmer's sliding vane pump will be on show at the 2017 AEGPL Congress in Lisbon, Portugal. This year’s event will bring together European and global LPG leaders to discuss the latest opportunities and issues facing the industry and Blackmer, part of PSG, a Dover company, will be featuring its sliding vane pumps for the LPG and Autogas market. Designed for high level performance and reliability in a wide variety of LPG applications, the pumps are well suited for cylinder filling, motor fueling, bulk transfer, vaporizers, and on bobtails and transports. 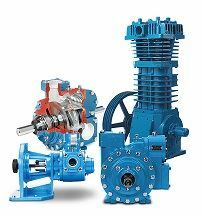 Utilizing Blackmer’s sliding vane design, these positive displacement pumps offer the combined characteristics of sustained high-level performance, energy efficiency, trouble-free operation and low maintenance cost. Additionally, Blackmer will feature its LB Series of oil-free reciprocating gas compressors, which meet the needs of the LPG market because they have been designed to deliver high efficiency in handling liquefied gases. These compressors are intended for railcar unloading and vapor-recovery applications. All of the LB Series compressor’s pressure parts, including the pistons, are constructed of ductile iron, resulting in greater resistance to both mechanical and thermal shock.